Your cat may think she’s your boss, but she would actually be your boss if it weren’t for a feat of engineering called the human hand, complete with opposable thumbs. It’s not easy to build a robot that can compete with that astounding piece of machinery. But the UK company Shadow has a solid contender. 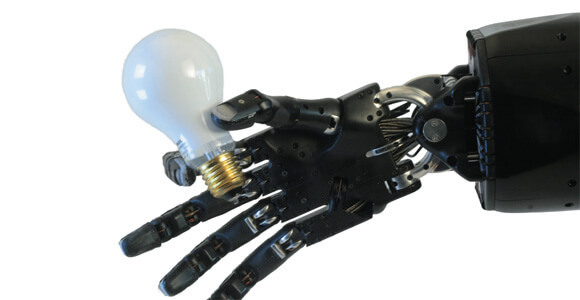 And while its robotic hands imitate nature, why keep nature’s limitations? Shadow’s Dexterous Hand “sees” the shape of the object approaching it to help it determine how to hold it. Capable of 24 distinct movements, the hand can come up with an almost human array of positions to hold a Rubik’s cube, business card or light bulb. The finger lengths vary like a person’s too, giving the hand a more organic feel than many of its competitors. Of course, like our hands, Shadow’s hand is only as good as the arm behind it. The hand itself sits Thing-like in a stand, but Shadow has designed it to integrate into other robots. Kuka, Denso, Willow Garage, Mitsubishi and Universal Robots have all mounted a Dexterous Hand, which runs on the open-source Robot Operating System, on one of their droids.